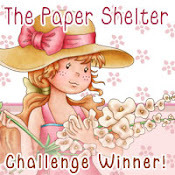 I used the colors in the challenge at Color My Heart. I stamped with stone gray distress ink and colored with ProMarkers, then die cut with dies from Spellbinders. 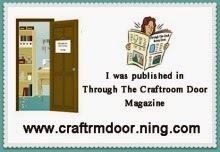 I actually used the frames from the outside of the die cuts instead of cutting the image piece itself. It gives some great texture and dimension. The bow is made with satin ribbon from my stash. 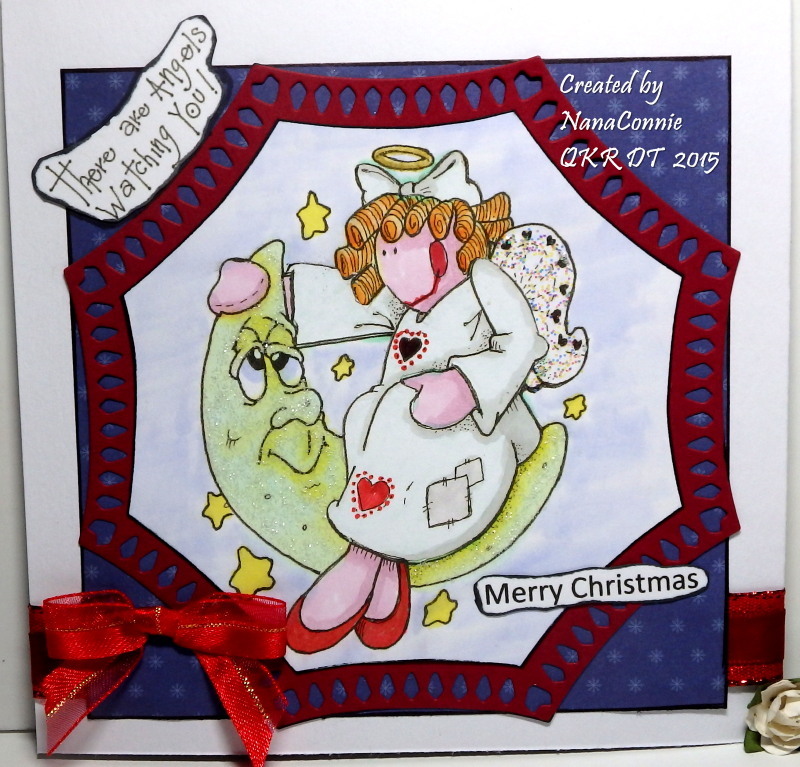 I've been on a Deedee's Digis kick all weekend and have used several different sets to make Christmas cards and tags. Just as I was thinking that I was pretty well caught up on the number of cards I need this year, I got another commission for eight cards. 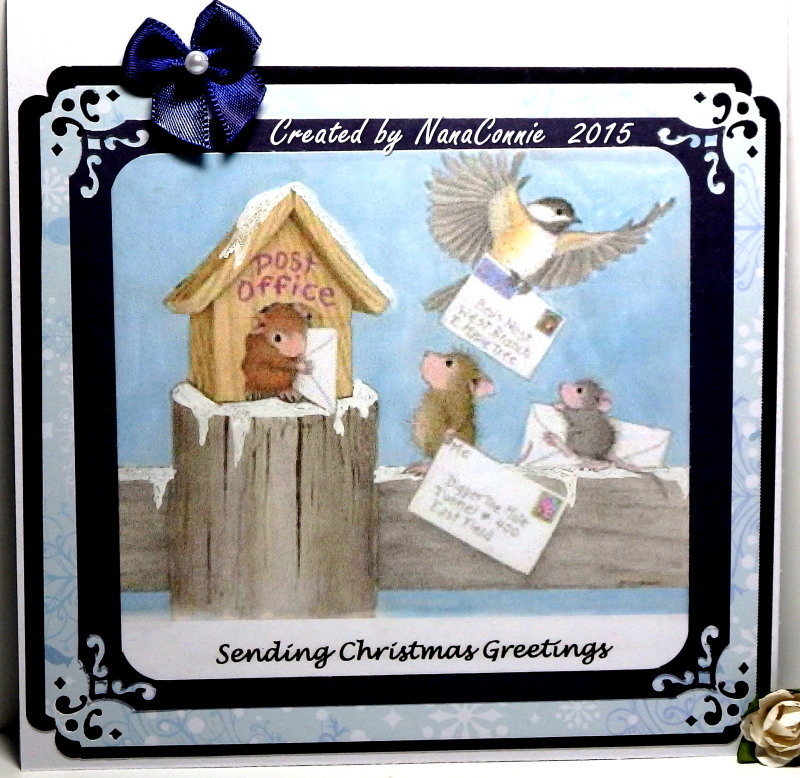 Then my neighbor, who loves all my cards and has ordered several from me over the last year, wants ten MORE Christmas cards! So now I'm hopping like a bunny to get everything done. I also want to let you know that Deedee's Digis is having a year end sale of 75% off all sets in the store!! Nothing over $.88! Can you believe those prices? Since Deedee has so many pre-colored images, and since those make cards go really quickly, I printed out 4 images for tags, and another 4 for cards. 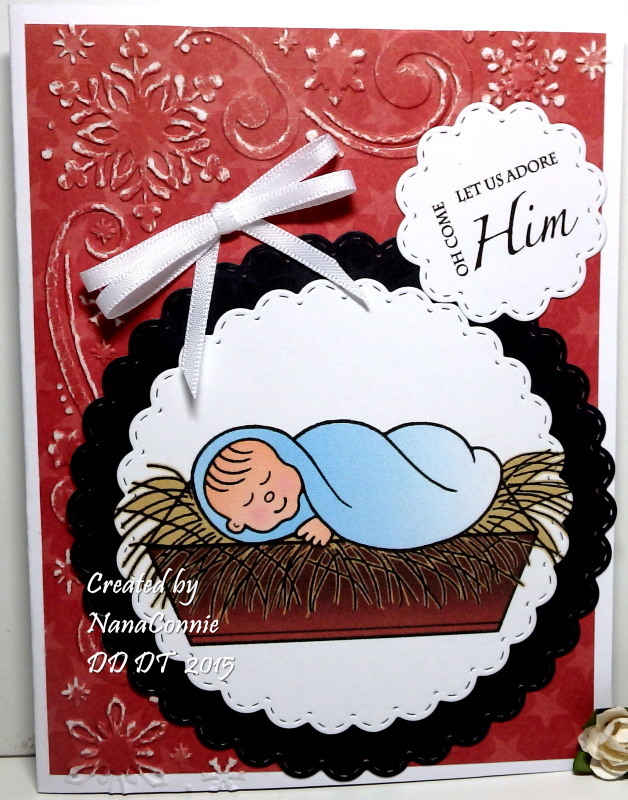 Here's the first one I finished from the "Away in a Manger" set. 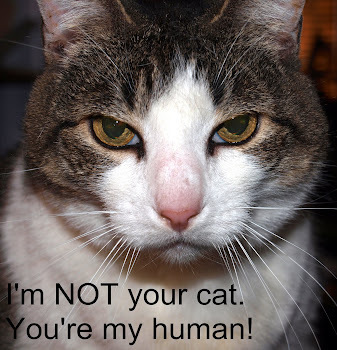 Both the image and the sentiment are from that set. I used my newest scalloped dies (Memory Box) and I love the stitching on them. 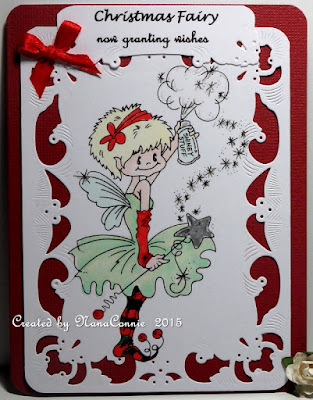 The background embossing is done with a folder from Darice used on red CS which has stars on it. The sentiment is also cut with one of the stitched dies. The bow is tied with my bow maker. For those of you in the USA, I hope your Thanksgiving was warm and wonderful and that you counted all your blessings. We have so much in this country and others have so little. Today starts the real Christmas rush but I simply refuse to participate in 'Black Friday.' 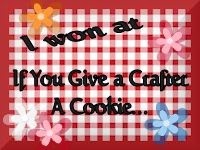 I'd rather be crafting than fighting the crowds. 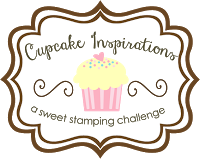 Today at QKR Stampede, we're starting a new challenge and our theme is "Angels," so appropriate for yet another Christmas card. If you haven't started yet, Christmas is exactly 4 weeks away. Yikes! I based my design on the sketch from The Sweetest Thing. I used Digi 14809 "Sitting on the Moon" for the image and Digi 10804 "Angels Watching" for the top sentiment. I colored the image with my ProMarkers, then added glitter to her wings and the moon. It doesn't show very well in the main photo but here's a closeup that shows how much it actually sparkles. I used one of my newer die sets to cut the image and the frame for it. 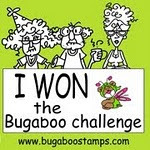 The background dp with the 'polka dot' stars is from DCWV and the ribbon came from my stash. Many Blessings on you and yours. It was finally time to do something other then a card for Christmas so I started on my gift bags. This is the first one but I have some others I may get done in time to share them over the weekend. This is a re-cycled vellum bag; originally it held a birthday gift but I wanted to combine the polka dots on the bag with the polka dots in the dp I chose. I thought the white dots looked a bit like snow and that made it perfect for a Christmas theme. This is a fun image from Aurora Wings (Anything but a Card) and I wanted to stay very CAS on this bag. I colored the kitten and lights image with my ProMarkers, then cut the image into a square and added the sparkly twine before adhering it onto the dp (SU.) That entire piece went onto the bag and it was done. I'll make a matching tag for it before using it this year. 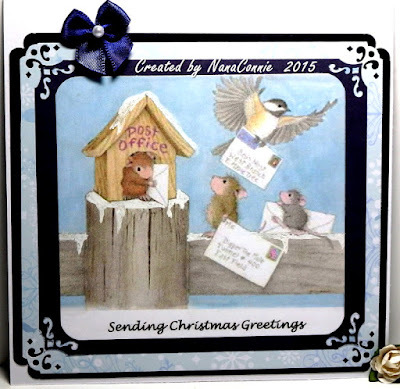 Many of us can still remember the days when postal lines were long and tiresome during the holidays and how we all waited by the mailbox to see who had sent us cards with lovely Christmas greetings. Except for those of us who still love actual cards instead of email or text greetings, the lines now are mostly filled with those who must mail packages. This card is in honor of post office lines of days gone by. I used punches and dies to frame out the image and the little bow is one of those I sew up by the dozens. This one was made from white ribbon and I used a ProMarker to get it the particular shade of dark blue that I wanted. 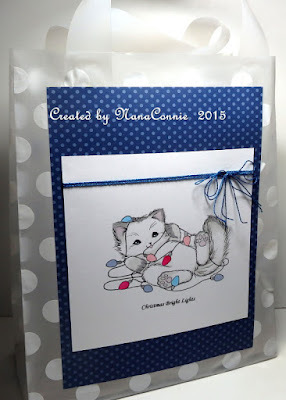 I've almost quit using colored ribbon for making these because it's so easy to use white and then just "dye" them the color I need for any card on which I'm using them. 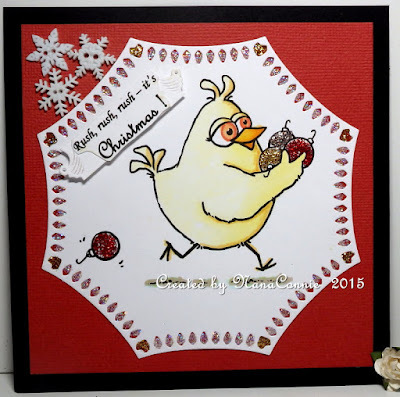 I used my ProMarkers to color the image and used one of my Darice embossing folders on the background. The sentiment is also part of that same MHK set. I added the bow and pearl for simple embellishment. This adorable image is from Deedee's Digis "Polar Peace" set and I just love it! I started with a pre-colored image, then added my own sky, some shading on the ice flow and under the critters, and also a bit of sparkle gel ink on the ice. 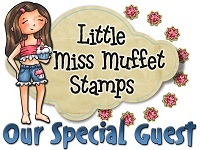 The image is die cut and corner punched, then layered onto a die cut mat. 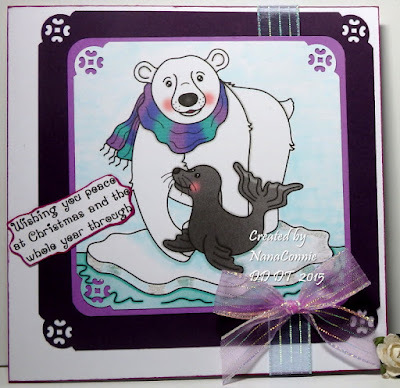 That piece is layered onto a darker purple mat and corner punched again. The sentiment is from that same set, hand cut and inked on the edge. I added ribbon scraps to wrap around the card front and to make the bow. 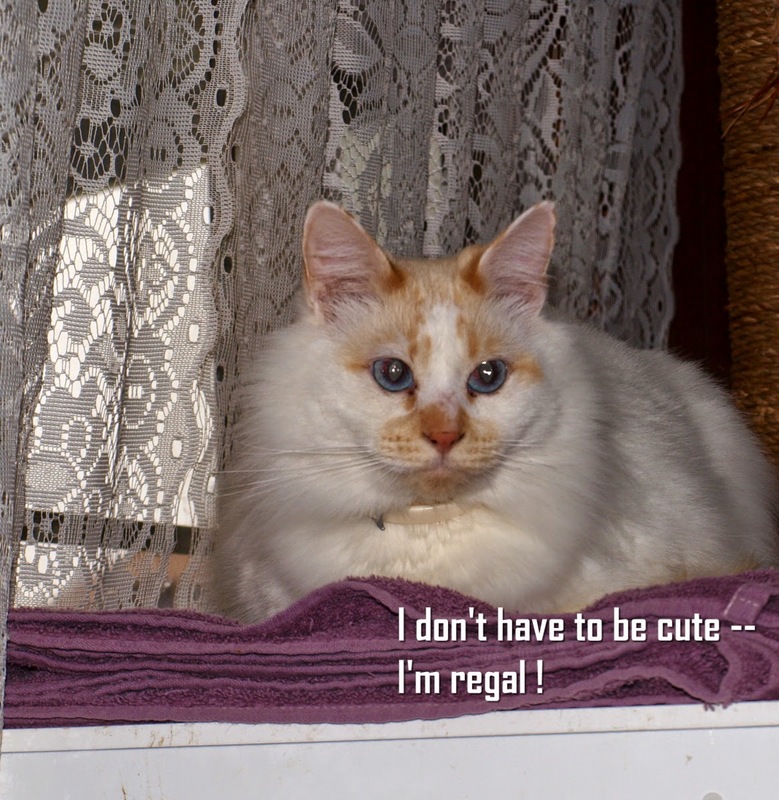 In fact, now that I think about it, everything is done with scraps including the white CS on which I printed the image and sentiment. Friday morning, only a week before Thanksgiving here in the US, and many states and cities have already had snow. That seemed to be a good reason to celebrate "Snowmen" in our new weekly challenge at QKR Stampede. I used colors from the inspiration photo at City Crafter. 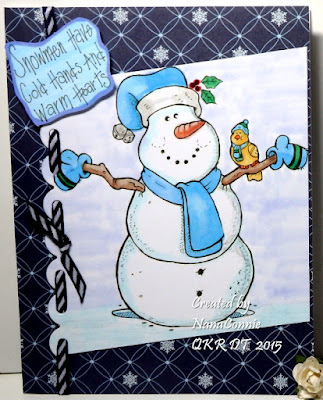 QKR has so many adorable snowmen in its collection but I chose this one, Digi 13004 "Winter Friends" and paired it with Digi 13804 "Cold Hands" for the sentiment. 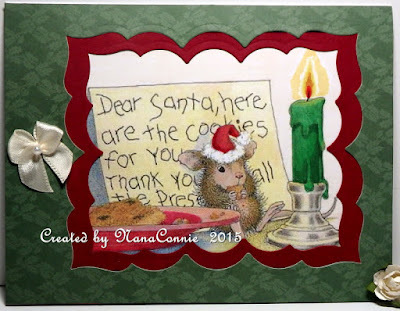 I used my ProMarkers to color the image and then used a scalloped border die from Spellbinders to cut one side of it. The sentiment is hand cut and inked on the edges. The background dp is from the "Winter Magic" stack by DCWV. I added the striped ribbon, lacing it through the scallops and then added the sentiment piece over the ribbon by using dimensional dots. It's a pretty simple design which looks more complex because of the patterns in the dp and the ribbon. The weekend is here already - can you believe it? This will be the last one I have to get things ready for Thanksgiving. Tomorrow, I'm spending the day (and night) with my granddaughters, getting the last bits and final touches of costumes sewn for their big day at our local Comicon. 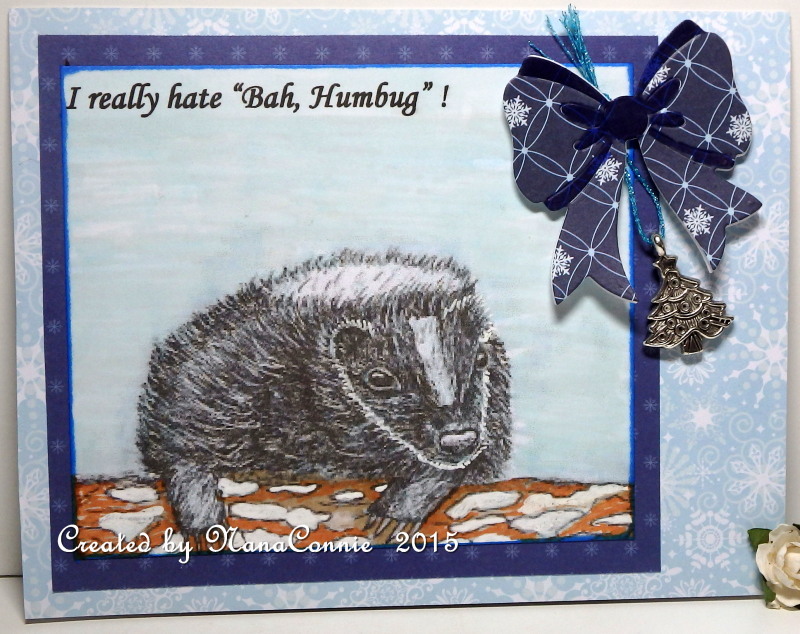 My dear blogging friend, Teresa of Tickell Expressions, drew this sweet little skunk (yes, skunks can be sweet!) and the first time I saw it, I just knew it belonged on a Christmas card. The sentiment popped into my head instantly. Today was the first time I had the opportunity to get that envisioned card made and here it is. The image is colored with ProMarkers and a white gel pen, then die cut with a rectangle die from Spellbinders. The mat was cut from dp with a larger die. The bow is also a die cut (die from Cottage Cuts) and I cut three layers of it (white, navy blue, and patterned) for some dimension. Both papers are from DCWV. The Christmas tree charm was in my stash. Lately, I'm finding myself really intrigued with silhouette images. I did a couple of Halloween cards with them and now I've found this delightful set from MHK Designs just in time for Christmas. I love the way Mynn has reversed the positive and negative on the silhouette! The sentiment is also from that same set. 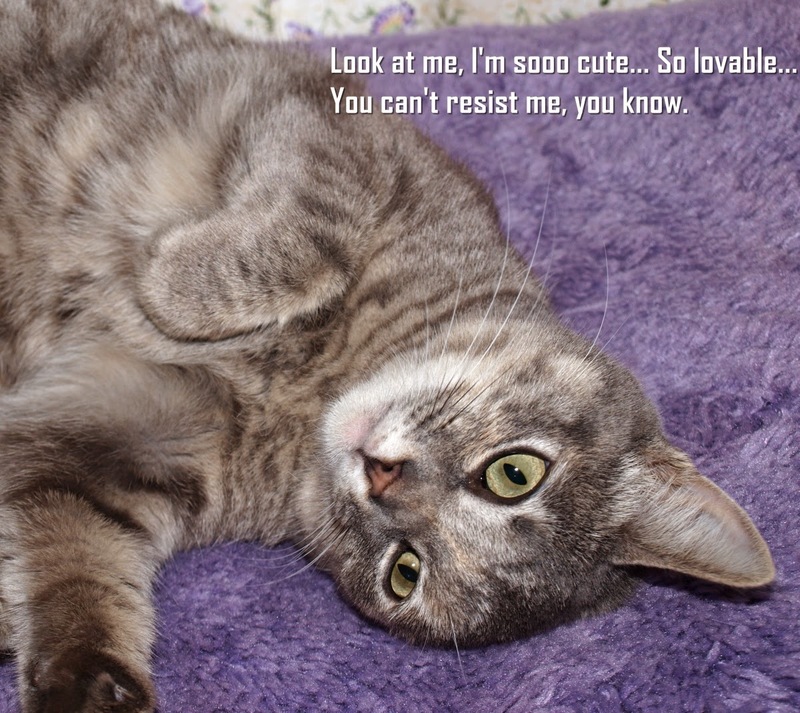 This is a pretty CAS design. I chalked the background before printing the image and then used an eraser to remove some of the chalk from the white silhouettes. 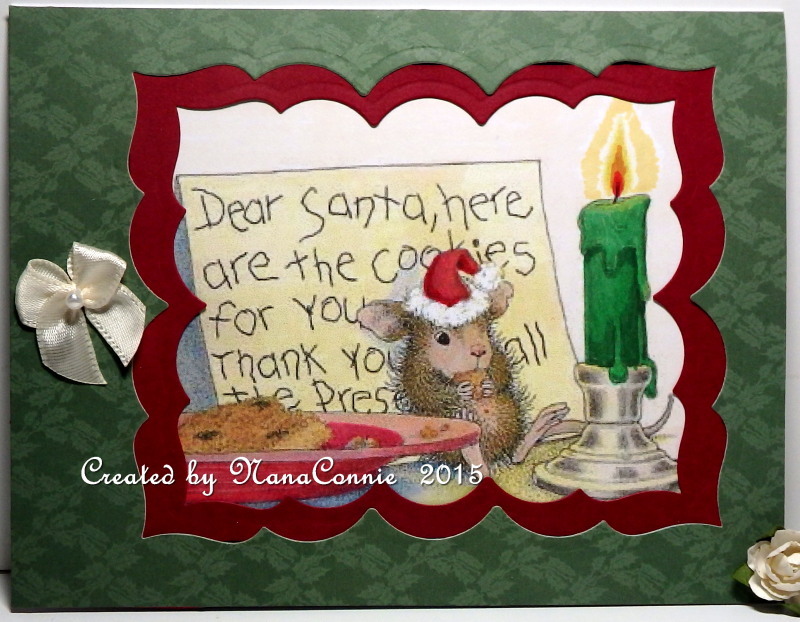 I added a button snowflake and made a 3-D poinsettia for the corner. I also found a pinecone shank button, removed the shank, and added it next to the poinsettia. Done! 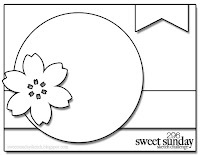 The whole thing took less than 25 minutes, including making the flower. 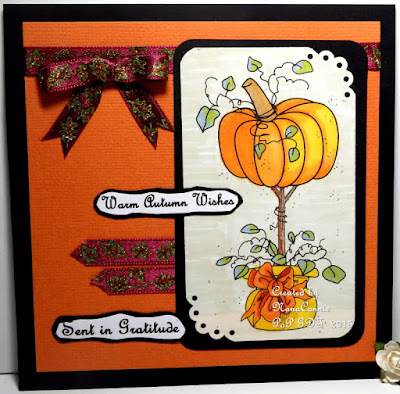 I love this "Pumpkin Topiary" image from Scribbles Designs and am so tickled that I got to use it for creating my last GDT card for Path of Positivity's "Thankful" theme this month. 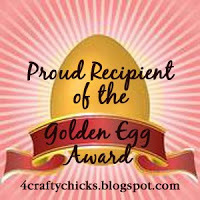 There are two wonderful sponsors; Kitten Scraps and Scribbles Designs and this image is from Scribbles. I colored the image with my ProMarkers and I love the way the fall colors make such a warm color combo. One of my favorite combos for the harvest season and Thanksgiving. Everything on the card was found in my scrap pile, including the sparkly ribbon. 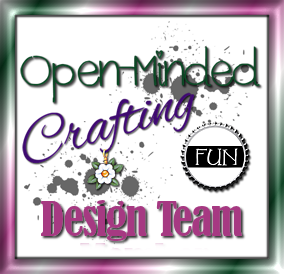 Nothing makes me feel better than using up scraps instead of cutting into new pieces of paper or spools of ribbon. I used punches and dies to get the shape on the image and mat but the sentiments are hand cut and matted. I left it without embellishment except for the ribbon because it was so sparkly that it was just enough. I used the sketch from the Outlawz Sketch Challenge. 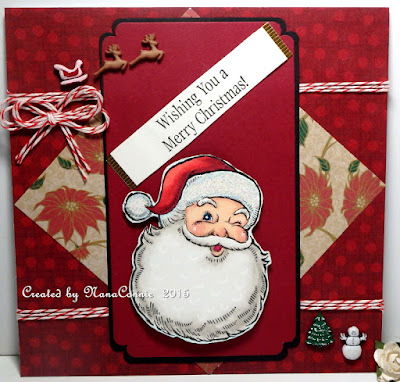 I fussy cut Santa and mounted him on dimensional dots to red CS, die cut that and added it to a black die cut a size larger. I put that entire piece onto the card after using two different papers to make the background and the diamond shape dp, and put on the wrapped twine. It's time to "Celebrate Any Holiday," the theme for the newest challenge at Pile It On this fortnight. 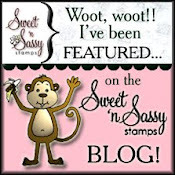 We are sponsored by Doodle Pantry, one of my favorite places to find images, sentiments, and papers, all in the same set. 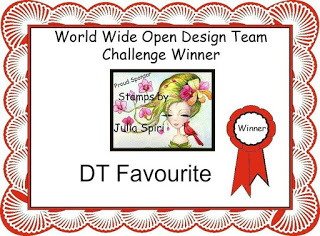 Having once served on the DT over there, I was so delighted to get this image out of my stash and use it. 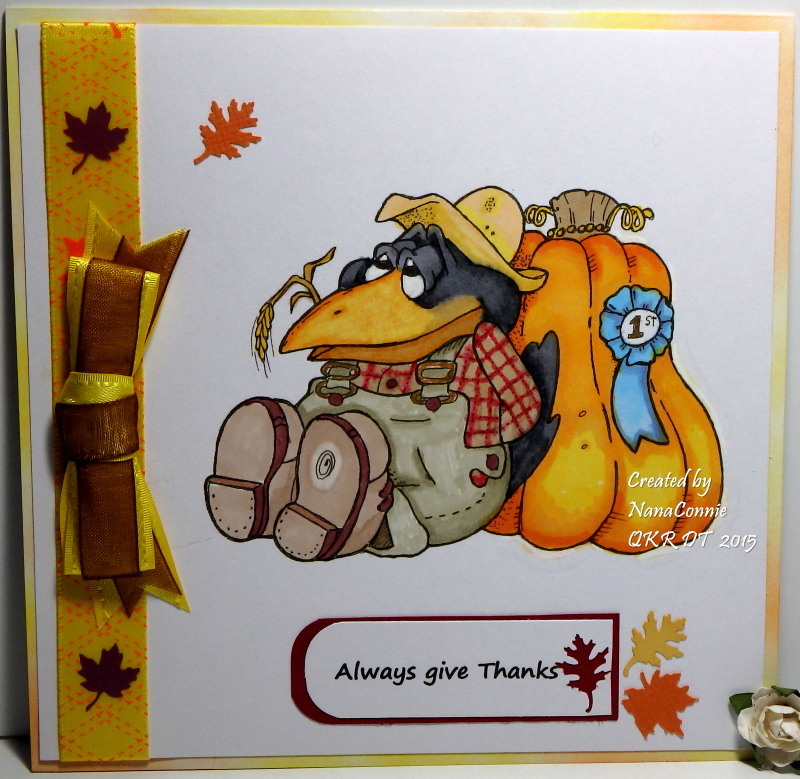 These are the pumpkins from the "Pumpkin Birdie" set, and the "Happy Fall Y'all" sentiment is also from that same set. 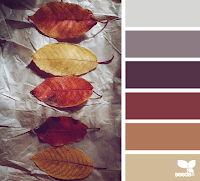 I used colors I found at Outlawz Color Challenge. 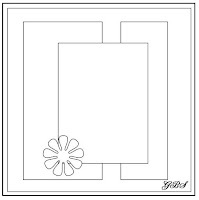 This is a pre-colored image, die cut with a framing die by Spellbinders and matted with another framing die a size larger. 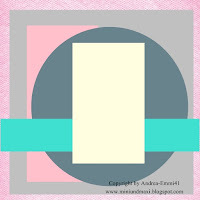 The larger frame is colored with chalks which I applied using a cotton ball. The diagonal strips are washi tape. The bottom sentiment is computer printed and punched. I added wooden leaves colored with ProMarkers, a hand tied bow which was 'dyed' with a ProMarker, and a punched, layered flower also colored with ProMarkers. The sparkly gold mesh was a leftover scrap found in my stash. I just noticed there's a new challenge on the FB page for AuroraWings and their theme is "Holiday Sprites." I love this little Acorn Sprite but have never used it before so I decided on Thanksgiving as my holiday. and took my colors from the Friday Coloring challenge at The Outlawz. The Acorn Sprite is colored with my ProMarkers, then die cut with a die from QuicKutz. The papers are from my stash and the yellow paper is embossed with Swiss Dots. The sentiment is computer printed and matted with CS. 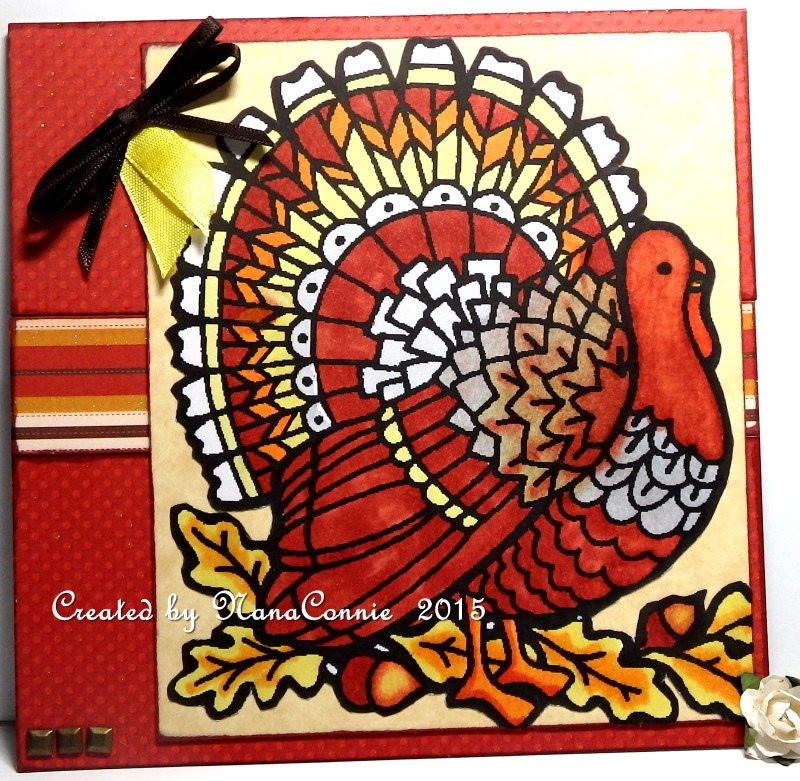 The "Thankful" sentiment is hand-printed on woodgrain paper, mounted on chipboard, and cut with a banner die. Finally, I added a bow, the flower (punched pieces layered together with a gem), and the three gems below the bottom sentiment. We've started a new challenge this morning over at QKR Stampede and our theme is "Give Thanks." My image this week is another crow, but not an albino one this time. To understand that reference, you'll have to check out this card I did some weeks back. :-D He looks nearly delirious to have taken a First Place award so I thought he'd be perfect for a "Thankful" card during this Thanksgiving season. Image is Digi 14306 "Prize Pumpkin." I used my ProMarkers to color the image, die cut it with my largest square die, and matted it with background paper I made with chalks. The leaf ribbon was in my autumn stash and the ribbons I used for the double bow both I think came from Really Reasonable Ribbon but it could have been The Ribbon Girl. 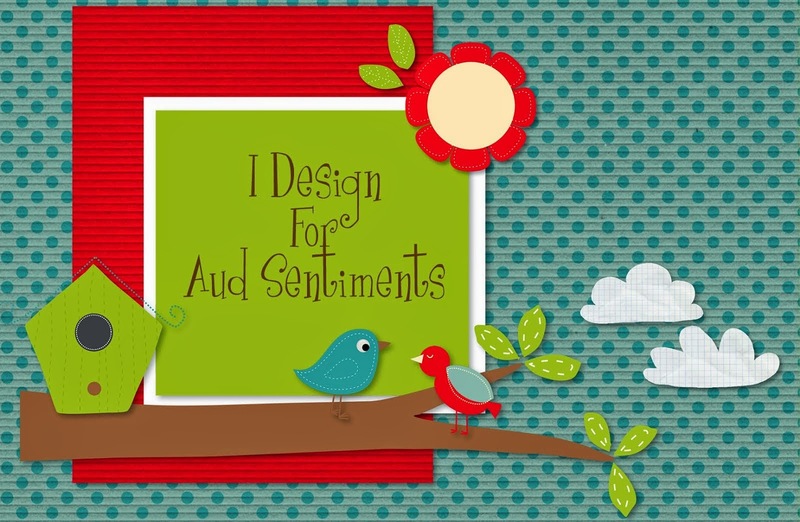 The leaves are punched and the sentiment is done with a banner die cut and a corner punched mat behind it. Take some time to Salute a Veteran today. 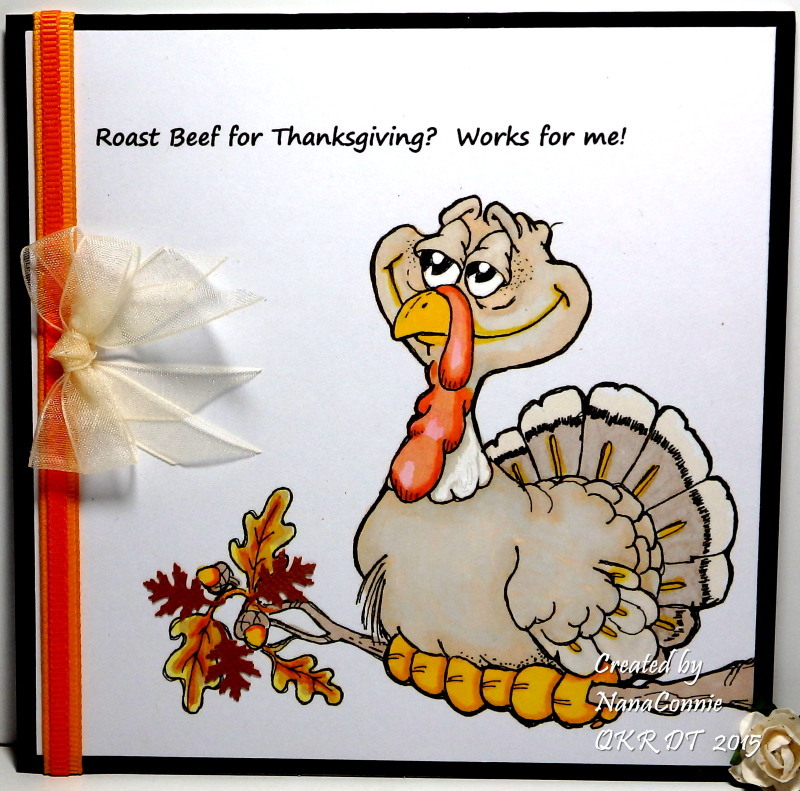 As I was cleaning and re-organizing the craft room over the weekend, I ran across this turkey image in my stash of Thanksgiving things. I have no idea when I printed it (it could have been 2 or even 3 years ago) or who should get credit for drawing it, but I decided to get it colored up and use it for one of my cards this year. Interestingly, I had adjusted the printing so that the outline on the image was printed in dark brown instead of black. Looked really nice. The image was printed on kraft paper and I used ProMarkers to color it. The kraft paper made some of my browns turn more red than brown but I actually like it that way. It was a nice contrast to the chocolate brown outline on the image. 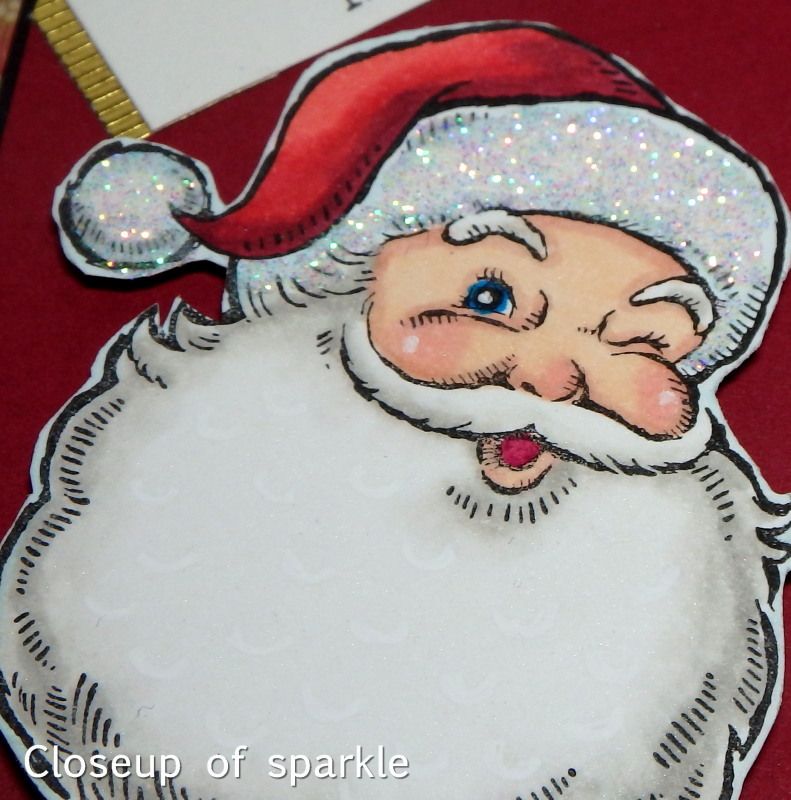 The polka dot paper for the background is heat embossed so IRL that paper has some shine and sparkle. The striped paper is from DCWV. I tied a double bow from deep chocolate ribbon using my bow maker and added two bits of yellow ribbon for contrast. The final touch is the three metal brads I added. 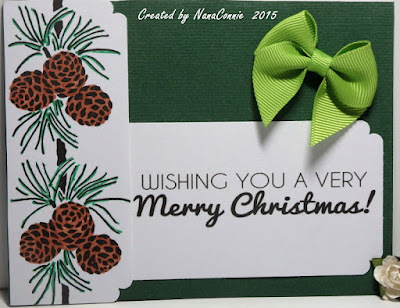 Very simple design even with the patterned paper. 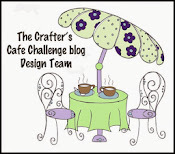 Today we start a new challenge at Tuesday Throwdown and the theme is "Thanks." 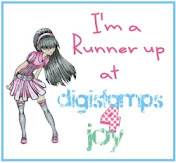 Our wonderful sponsor is Deedee's Digis. I just happen to be on both of those DTs so this was a really happy card for me. 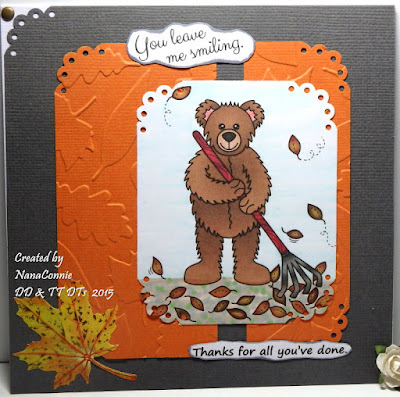 I used the fun bear from Deedee's "Leave me Smiling" set and chose the pre-colored image which made it a much faster card to make. This theme fit perfectly because I needed one more Thank You card for a local non-profit group and, since they raise funds for Juvenile Diabetes education, awareness, and for scholarships to the summer camps for diabetic kids they put on, it's an agency near and dear to my heart. My grandson is now 9 years old and was diagnosed with Juvenile Diabetes 18 months ago. One of the Board Members had to resign from the organization because he and his family were moving out of town and the Board Chairman needed a card to say thanks for his service on the Board. Since the name of the organization is "Smiles for Diabetics," I thought this would be a great sentiment. I used the sketch I found at Cheerful Sketches. I embossed the orange CS with one of my newer folders before adding the image piece to it. 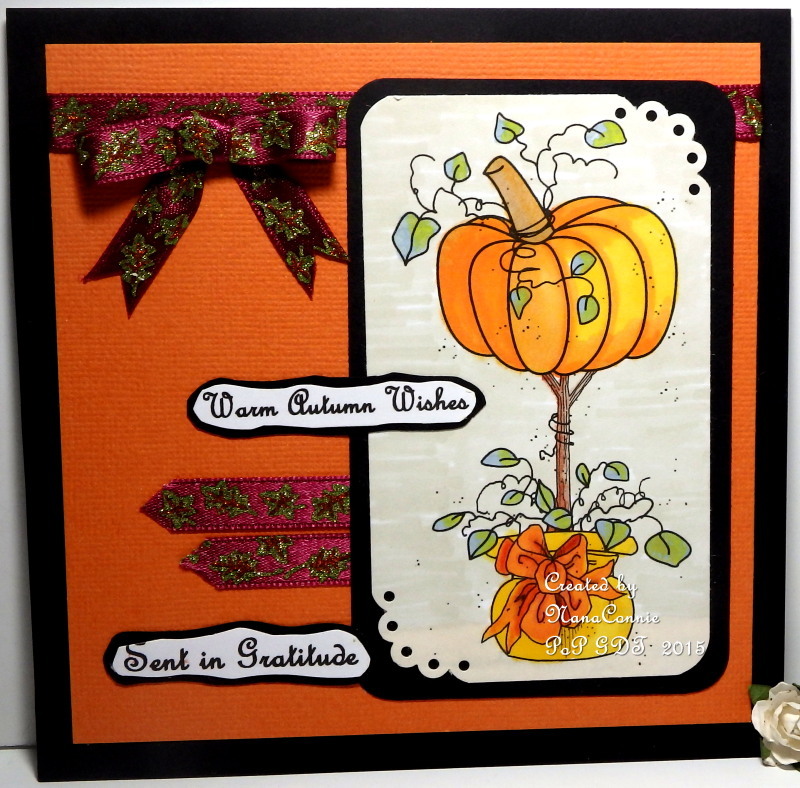 I used a Fiskars corner punch on the image, the orange mat, and the gray background CS. I added one small metal brad as an embellishment and found the yellow leaf sticker in my stash so added it. The top sentiment is part of Deedee's set and the bottom one I printed with a computer font. Each one is hand cut and inked on the edges. 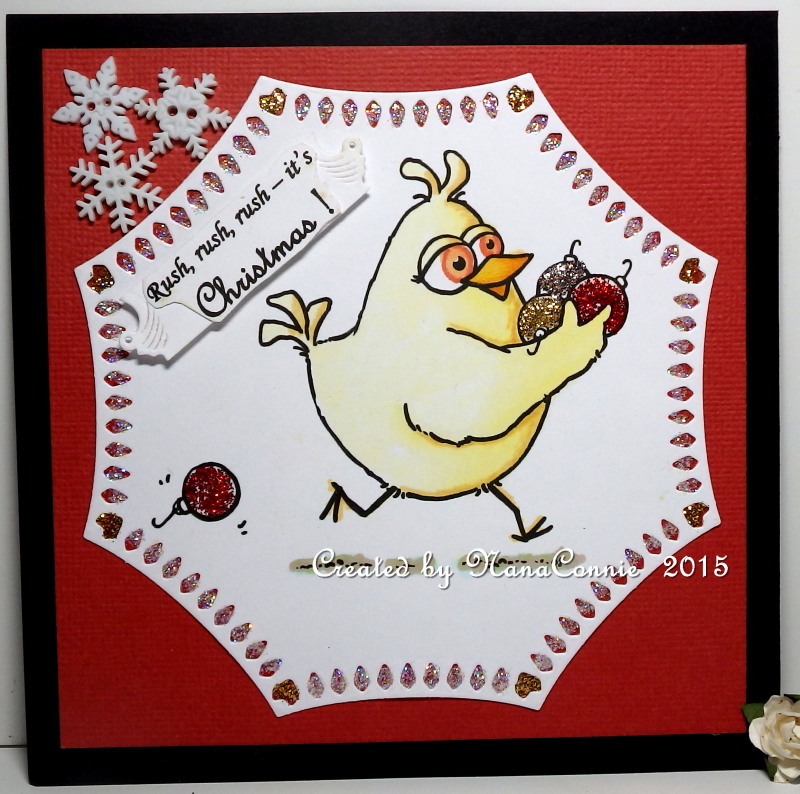 I colored this little Birdbrain with my ProMarkers and used one of my new dies from Spellbinders. To balance off using something brand new, I dug out my collection of Stickles (unused since last Christmas season -- I've recently been doing mostly loose glitter for some reason) and used three of them on the ornaments and on the negative spaces of the die cut frame. I matted the image with red and mounted it onto a black card front, then added the snowflake button embellies from my stash (also from last year.) The sentiment is computer printed, cut and embossed. 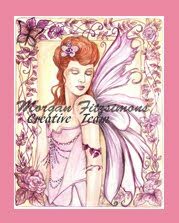 I colored her with ProMarkers, a touch of watercolor on her hair, and added sparkle gel ink to her fairy wand, her wings, to the little stars and to the Shiney Stuff can. Unfortunately, the sparkle doesn't show up very well in the photo but it's really wonderful IRL. 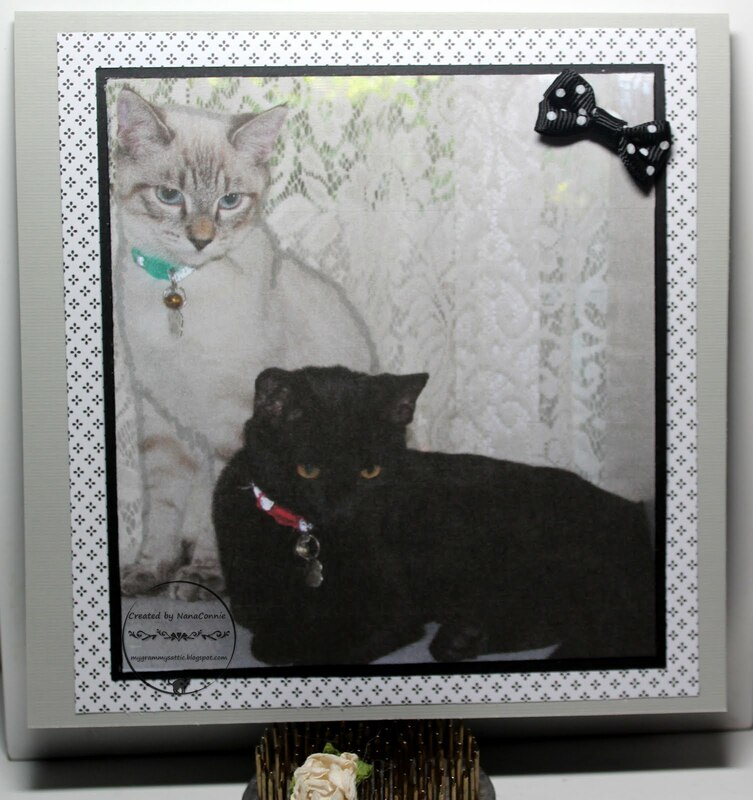 I used one of my framing dies from Spellbinders to cut out the image and also to die cut the sentiment. After I embossed both of those, I rounded the corners of a red card blank and mounted the image directly onto the card front. I tied the lovely little red bow and adhered it to the top corner. I really wanted to let that fancy die cut do all the work so I did no other embellishment. 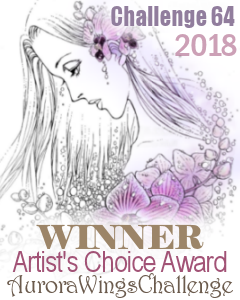 Time for the next part of the Progressive Challenge over at Sparkle and Glitter where Rick St Dennis' art is shown off so magnificently. I do love his images! This month we get to use any RSD image and I chose something that works for Christmas. 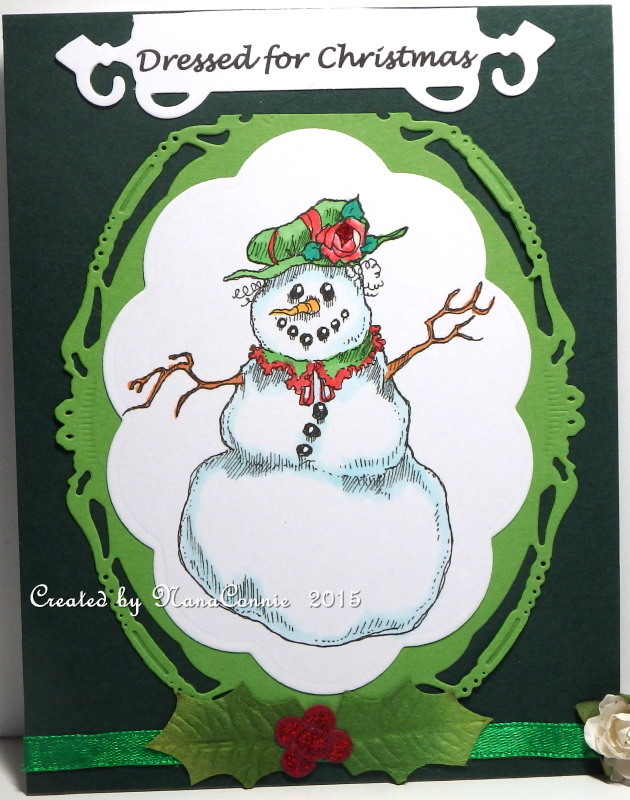 It's called "Mrs. Frosty" and she reminds me of the animated Christmas film for kids, "Frosty the Snowman." Can't you just hear everyone singing "Winter Wonderland" all over the open meadow? 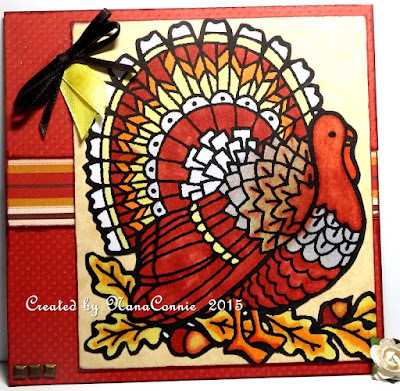 I colored the image with my ProMarkers and die cut it with one of my scalloped dies from Spellbinders. Then I framed the scallop oval with a cut from a Spellbinders' framing die. 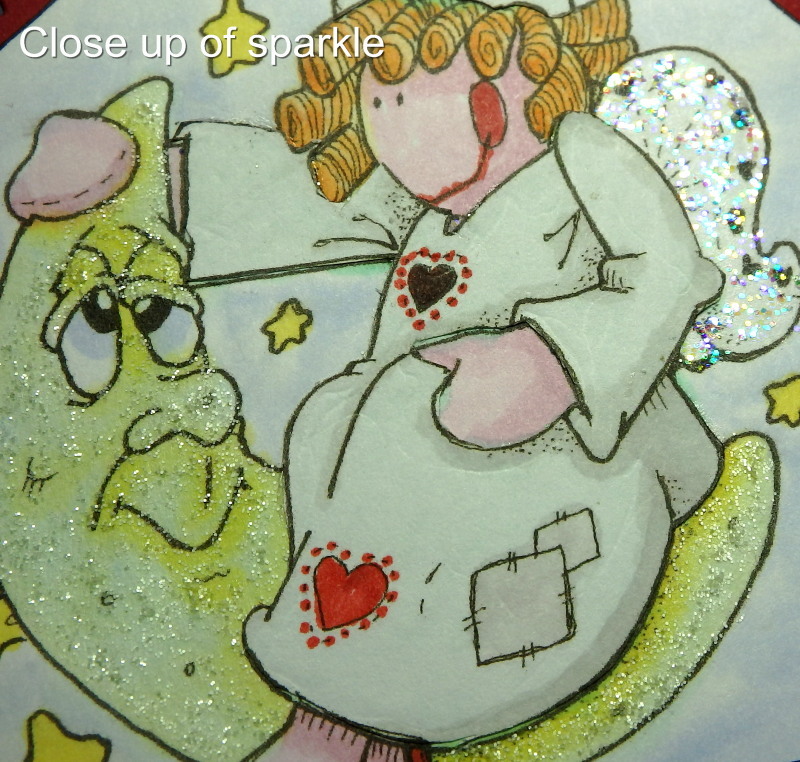 The sentiment is also cut with a die from Spellbinders. I mounted everything onto dark green CS, then added the ribbon. 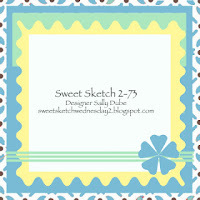 and used colors from Crafty Gals Corner. I colored the image with my ProMarkers and cut it into a 5 inch square. I mounted that onto black CS and added the double ribbon and the sheer bow. Beyond that, I left it very CAS. 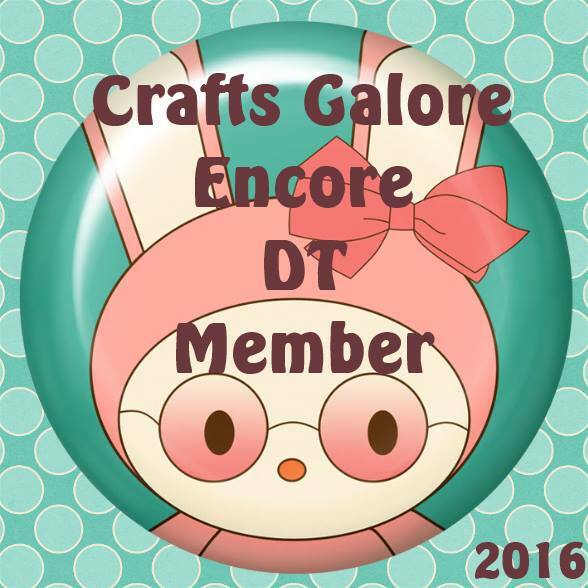 I'm so enjoying the sets from MHK Designs! I think I have almost all of Mynn's sets but she comes up with new releases every month so I may have missed one. :-D But this set is so perfect for Christmas and I knew it would be best used in a very simple design. 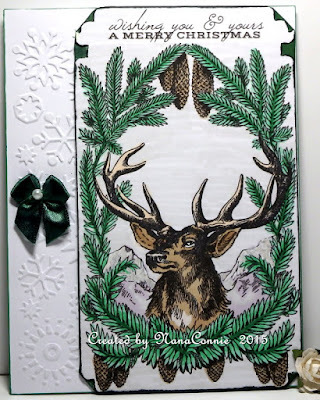 I used my ProMarkers to color the pine cones, then cut them out and punched the corners. I sized the sentiment fairly large so that it would be the focus of the card, printed and punched the corners of that piece as well. 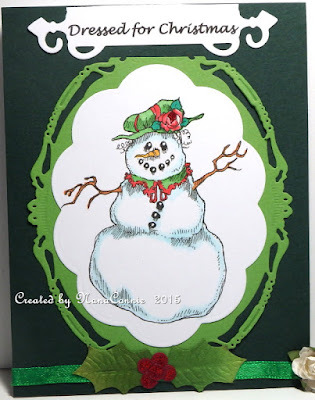 I layered everything onto forest green CS and mounted all of it onto the card front. It looked just a bit bare in the upper corner so I added the bow. Perfect!